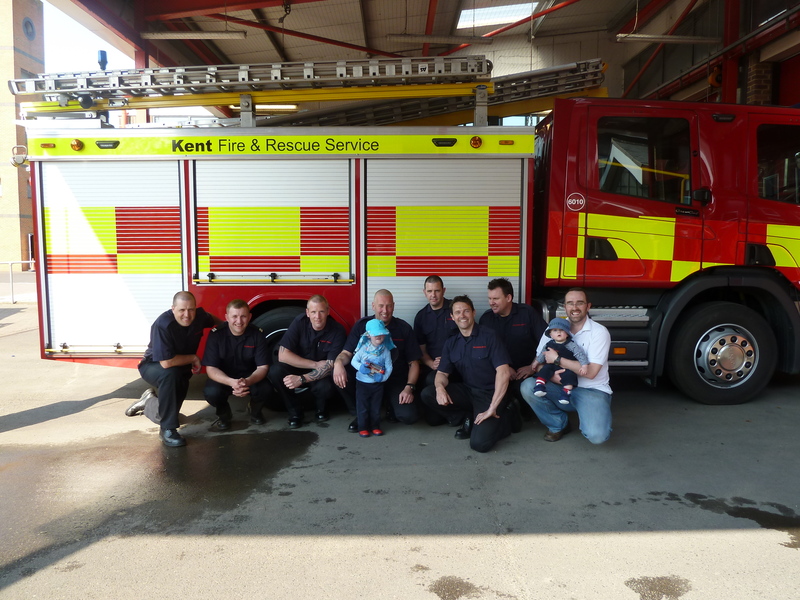 Back in April we received a wonderful email from the fire-fighters of Ashford Blue Watch saying that they would like to help out and raise some funds toward my Indoor Garden. 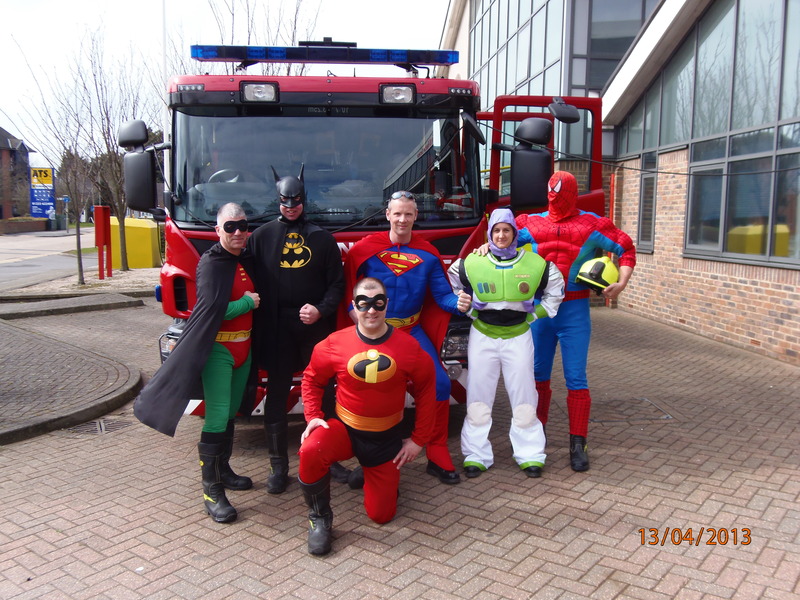 They came up with a wonderful idea…to do a car wash…but while dressed as Super Heroes! They had a fantastic day and lots and lots of people turned out with their dirty and very dirty cars to be washed, in fact over 100 cars in one afternoon! I think they must be real super heroes to be able to do that, not just pretend. As well as raising lots of money, they were able to speak to lots of people and help spread awareness about the few children like me who have XP. They even let the children who came with their parents have a sit on a real life fire engine! Very Cool!! I was very eager to go and say thank you to everyone at Blue Watch, so I was VERY excited when they invited me to come along and say hello. All day before we went I was very excited and kept reminding my baby brother Raife, that we were going to see a “fire truckie”. When we arrived Fireman Neil opened the big station doors to meet us and I saw all the huge, red engines. I did get a bit shy, but was very interested when they showed me the office and I got to meet the rest of the crew, I even got to say hello to a real Fireman Sam, and see a Fireman slide down their Fireman`s pole! Fireman Neil showed me all the equipment they use; their boots are very heavy! I think I would be a great Fireman as they also wear gloves and a big hat with visor and have to cover all their skin to keep it safe. When I saw all the amazing engines I wasn`t shy anymore and I had lots of fun looking at them all. I even got to sit in the driver`s seat and do some driving and see the flashing blue lights! It was so exciting!! 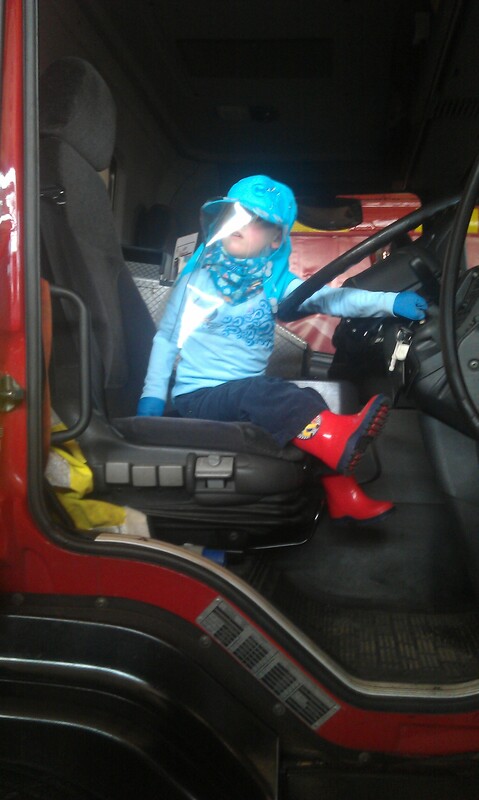 I had to wear my protection during the visit but my new Fire-fighter friends were very good at helping me in and out of the engines so that my hat stayed on…they are very high, it`s a big climb! After I had been around all the engines (several times)…..I had a very special treat. Raife and I got to sit in the back of an engine with Mummy when the siren was on…it was very loud, I was amazed how brave Mummy and baby Raife were! 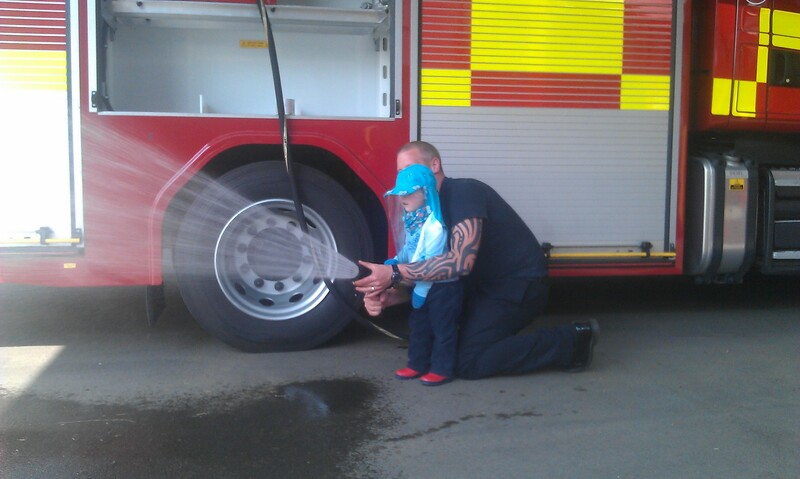 Just when I thought I would burst, with the most fun ever, I then got to be a real Fireman and spray their water hose. I was very glad that Fireman Nathan was there to help me as it was very heavy but we really enjoyed trying to wash the cars in the carpark. 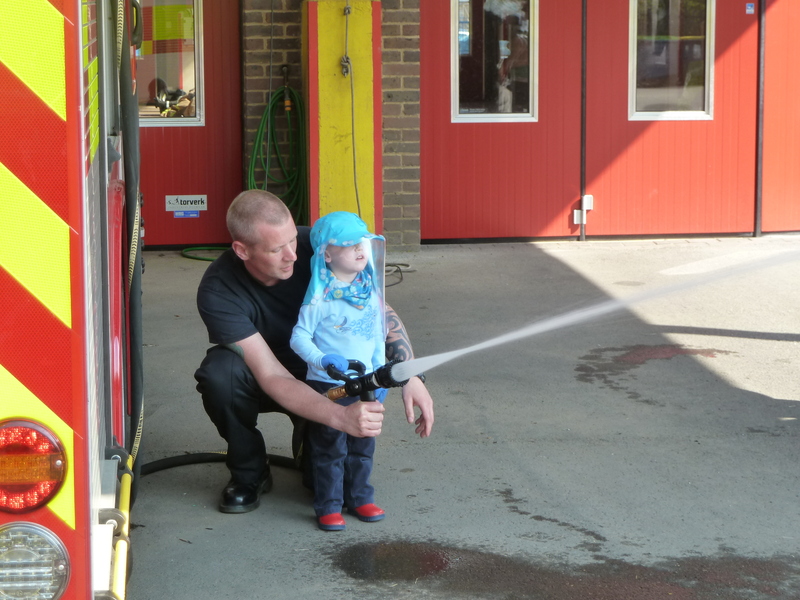 Raife and I had such a wonderful time with Ashford Blue Watch it was an amazing afternoon we will all remember for a very long time, definitely long after when I am 3 years old! Thank you all at Blue Watch for your fantastic fundraising efforts, a wonderful afternoon and for my very own, little red fire truckie! It`s been a very busy week this week as Mummy and Daddy start to get me ready for summer! 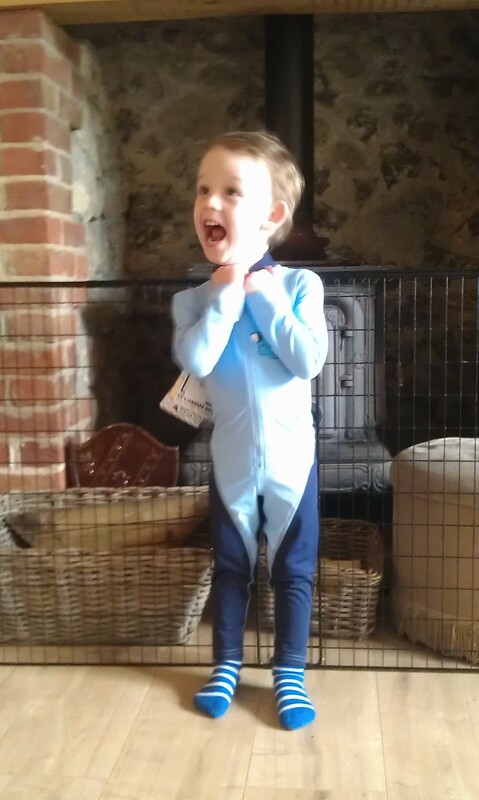 I was very excited when a big parcel arrived in the post and it was my new UV clothes for the warm weather. Mummy and Daddy found a company in Germany who make UV clothes. These clothes are very special as they are cleverly designed so that they block UV from passing through and so keep my skin underneath safe, and what makes them extra special is that they are very lightweight and breathable. This means that they will help keep me a bit cooler in the warmer weather and allow me to continue to have a little outside time before it gets too hot…and best of all Daddy says they are very snazzy! Mummy and Daddy tell me how lucky I am as these new clothes are very expensive and I have these thanks to the Teddington Trust and the army of wonderful people who have supported us over the last year. Another very exciting thing happened this week; I had my first visit from a wonderful new friend Dawn, or as I call her “the lady Dawn”. Dawn is part of our local home Portage Service, who visit children in their homes to give them fun play opportunities. Dawn is going to come and visit me every fortnight and bring me fun new toys to play with together. We will play with large play equipment so that I can experience some big play that I can`t otherwise do easily outside and exciting sensory games. This week we had jungle grass which I just loved having between my toes and I even got to keep some big jungle animals to play with until I see her again. In the future she may bring me things from the beach, woodlands and other fun things. I have my own nature box at home too, which Mummy and Daddy started when we found out I had XP. When we go on little trips we collect things like shells, twigs, cones, bark and leaves. When I come home and I can take my gloves off this means I can fell all the wonderful textures of nature and smell their smell. I even have an acorn shell thanks to a woodland walk with my Auntie Becky and Auntie Cara, although it was so prickly that I did even feel that one through my gloves! Mummy is on the countdown to the end of the school term as this is when my weekly activities (which are made safe for me) will end. This means that the places that I can go outside of the home will be very limited, as it will be too hot to play outside by then and the safe indoor activities I go to will be closed for the summer break. Mummy says that will make our week seem very long….and I think a bit boring. Of course I will have my baby brother to play with, and we will still see Dawn every fortnight, and I will be able to have my friends Finlay and Zahra over to play, which is always fun. But I will miss being able to have my short spells out on my bike or seeing all my friends at my activities. Once the summer starts, I will start my own new countdown…..I will be counting the days till autumn when the weather cools and I can come back out again, then the clocks go back and best of all I can play after dark, freely without protection, being safe while I run, slide, jump and swing, with lots of energy to burn off after my summer inside. But for now, we are just hoping that the hot weather stays away as long as possible so I can make the most of my time out of the house and my new UV clothes!